In its fifteen years in business, Guild Anderson Furniture have never sat still with their designs for bespoke fitted and free-standing furniture. The company is constantly innovating, taking advantage of technical or mechanical advances, tracking developments in appliances, seeking the best drawer and hinge, tap and handle to stand the testing demands of a busy household. As a small, streamlined company, the design team remain close to their clients and are in a position to have a real-time ear to the ground as to what works and how a particular design could be improved in any way. Customers have the advantage of Guild Anderson’s recommended selection from their wide experience of different suppliers. The company has a good eye on the trends in the market and know which design styles will appeal. ‘Modern kitchens are often thought of as being sleek and minimalist, with smooth surfaces and sharp edges. 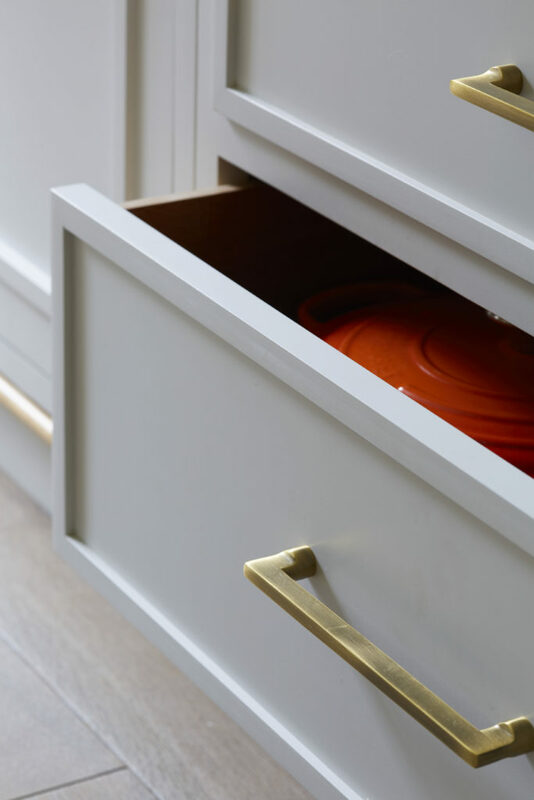 However, a ‘contemporary’ design equally describes the form and proportions of the cabinetry as well as the materials,’ says Nick Anderson, Head of Design at Guild Anderson. 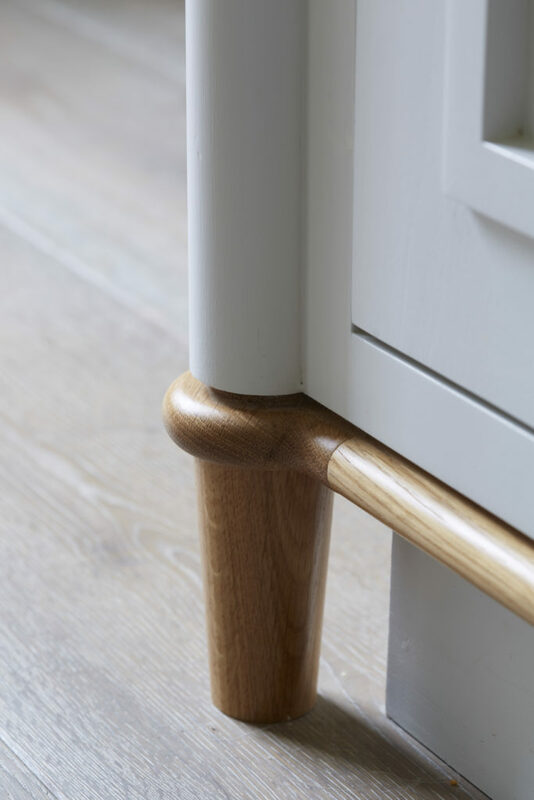 Although no two commissions are ever the same, one new style that is proving popular among clients, is the ‘Bucknowle’: a graceful, sleek, contemporary cabinetry design, legged, with an applied oak beading. The Bucknowle style came about from an original design for a commission for a pair of free-standing wardrobes. The turned leg feature evolved from here. Playing about with the design concept for a new client’s kitchen, Nick experimented with extending the cabinet leg upwards to run vertically up the side of the cabinet, with a lacquered oak trim running along the top and bottom of the run, providing framework and symmetry for the cabinetry. To date, the Bucknowle has been interpreted as a kitchen cabinetry style as well as a freestanding wardrobe, glasses cabinet and larder cupboard. For each, the fundamentals are the same – the turned posts, the oak trim, the tapering leg element. These are then interpreted to suit the proportions of the furniture and the room it sits in. For example, the leg section of a glasses cabinet designed recently for an Arts & Crafts house was extended to make the cabinet taller, slimmer and more elegant. The beautifully turned oak legs run the full height of the cabinet and a bullnose trim wraps around each corner at the top and bottom. Inside the glasses cupboard there is discreet LED lighting and the interior is veneered with a rich, blue tinted birds-eye maple veneer. This is a stunning example of contemporary furniture in its own right. The result is a statement piece that could be moved to a new home in the future, more a stand-alone piece of furniture than simply a cupboard. The Bucknowle style can be found in the new Guild Anderson Design Studio in Tisbury, open by appointment. The signature turned legs are evident together with simple applied beading to the cabinetry doors built as a row of floor to ceiling cupboarding. 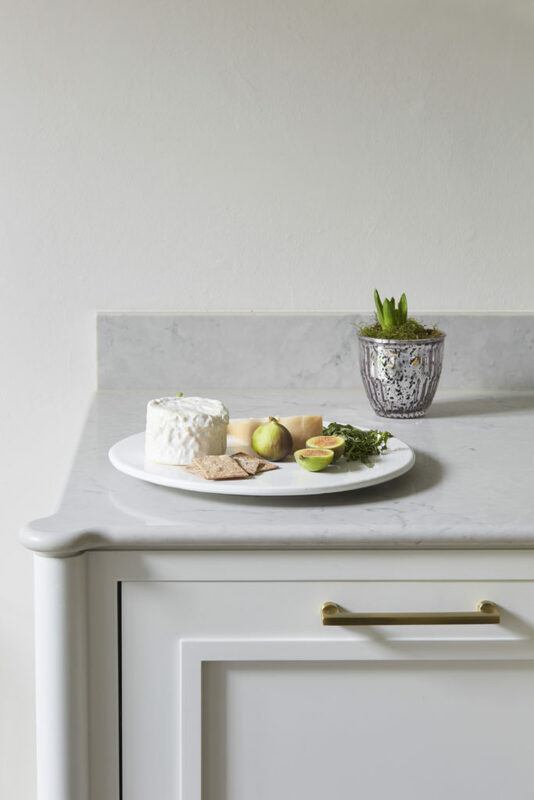 These larger sized cupboard doors are often a feature in Guild Anderson’s contemporary kitchens and, as fitted cabinetry, make an impressive focal point. ‘Finally, what is really important to this design, is the finish – the handles, taps, appliances and worksurfaces,’ Nick concludes. ‘This is the fundamental point of all our designwork: you can’t pull it apart, it is not a collection of bibs and bobs that make a kitchen plan work, but the design as a whole. Altering plans too much makes a design loose coherence. This is why we aim to get our designs right for our clients from the start.’ Nick is happy with the way the Bucknowle cabinetry style has developed. ‘Sometimes you just have a good idea and you try it out’, he says. ‘Pivotal moments are sometimes few and far between but this is one that worked well. The Bucknowle underlines our focus as fine furniture makers, designing and making classic but contemporary cabinetry’.